several years ago, i worked at crate and barrel, back in the days when it was a much smaller company. at that time, they had a great employee benefit known as the schtickel shelf. items that were not quite right to be sold to a customer due to damage or imperfections were put on the shelf and employees could purchase them for next to nothing. admittedly much of the stuff in my house came from the schtickel shelf. i have copper pots with dents, a lopsided, manual pasta maker, baskets that don’t stand straight, odd ball pieces of flatware and the like. 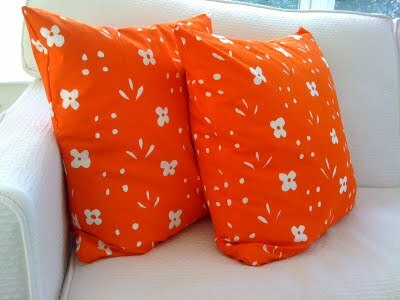 one of the best scores from the shelf was several bits of marimekko fabric. i sat on these fabric remnants for nearly thirty years. they were moved from apartments to houses as i was saving them for a special, yet undetermined project. this month i decided that 30 years was long enough to schlep this around with me. so i made a whole bunch of pillow covers. the project made me fall in love with marimekko again. i’m not crazy about much of the current ‘mekko, but the older designs from the 70’s are some of my favorites. i plopped the pillows all over the place in the past week or so. they remind me of happy days at crate and barrel where i made some great friends, worked hard for very little pay and had little else to worry about. now i am on a mission to find more marimekko from that time. do you have any piccolo fabric in red and white?